Action mapping: Action mapping is a visual approach to analyzing a workplace performance problem and designing solutions. When training is part of the solution, action mappers focus on designing practice activities, not information. Scenario design: Scenarios are realistic practice activities that challenge people to make decisions and learn from the consequences. Improving the training profession: Rise up, fellow training designers! This site is for people who design training for adults in business, government, and NGOs. It isn’t intended for academia (why not?). Cathy Moore is an internationally recognized training designer dedicated to saving the world from boring instruction. She created action mapping. Here, you’ll find ideas that will help you solve the following problems. I have a new training project and want to avoid an information dump. 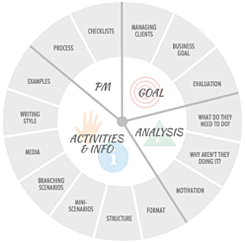 Get tips and custom advice for your project: Will action mapping work for my project? Flowchart with video walkthrough: Will training help? I want to advance in my instructional design career. I don’t see my problem listed.